Nose: Sea salt, smoke – more barbeque than peat, lemon, vegetal notes, vanilla slice, and crackers. Some fresh malt is also lurking around the back there. Palate: Very vegetal, and the peat that was practically non-existent on the nose is boisterous on the palate. Still slightly salty, but also a bit sweet – and reasonably malty. Very medicinal for an Octomore – not even close to Bowmore levels, let alone Laphroaig, but notable for an Octomore. There’s a bit of green apples and grapes as it heads across the back of the tongue. Mouthfeel: Quite thick on the tongue. Not chewy thick, but no lightweight. A bit oily, and a small tingle of burn. Finish: Damn quick for an Octomore – a little disappointing with the length really. The peat still hangs around in quite a dominating fashion, but there is also quite a bit of fruit – mostly the green apples and grapes from the palate. It’s quite a sweet finish too – especially compared to the palate. Balance: There are quite a few flavours bouncing around in this whisky – vegetal, salt, and sweet fruits and malt, along with plenty of peat. Apart from a distinct lack of peat on the nose, the flavours are consistent throughout this whisky. The flavours surprisingly aren’t at war with each other, but march side by side; leading to a rather well balanced and rounded whisky – especially for one with such a high peat level. Bruichladdich’s Octomore 3.1 was aged for 5 years in Bruichladdich’s warehouses on the shores of Islay. It was bottled at 59% ABV, with a production run of 18,000 bottles. 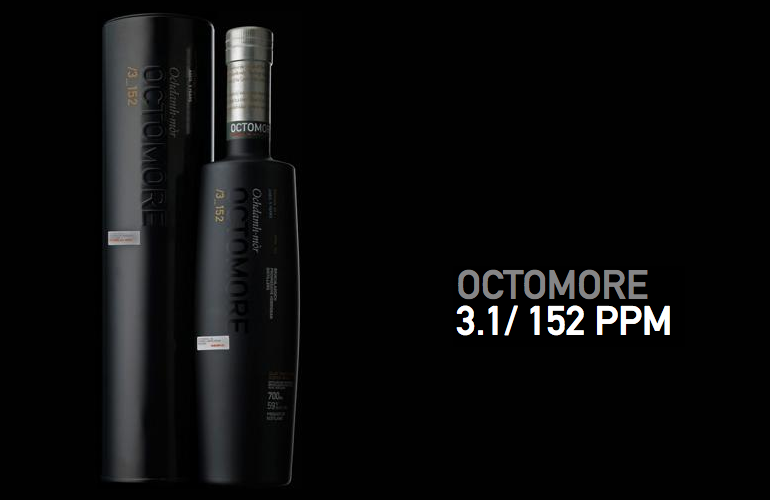 Octomore 3.1 was peated to, what was at the time, the world’s highest peat count of 152ppm. Octomore 3.1 contains no chill-filtration, and no artificial colouring. This is a big, bold, and boisterous whisky – there’s several flavours vying for attention, although (perhaps apart from the peat) none really jump out ahead of the others. This is definitely not a whisky that you have at the start of your night (unless you’re doing an Octomore tasting or something similar), or it will wipe out everything you have after it. This is a thoroughly delicious whisky; although I’m a peat-tragic – so, like all Octomore releases, if you aren’t a fan of the rotting vegetation in your whisky, this one is definitely not for you. Bruichladdich is definitely still finding their way with their Octomore range, but Octomore 3.1 comes damn close to the spirit that we know as Octomore today (and have done now for the past several releases). This release is a bit more medicinal than later releases, and is uncharacteristically short on the finish, but on the whole is almost there. If you like peat, this is definitely a whisky you should try if you ever find some.